Doctors on the Peace Ark told her she had to exercise, by running, to save her life. "Run? You mean walk?" she answered. That's what a patient (name withheld) told the Sun that doctors on the Chinese medical boat, docked at the Dame Eugenia Charles Boulevard for a week from Friday October 12 to October 19, 2018, told her when she accessed medical help for a gastritis problem. She had been to local doctors many times in the past for that problem. "The visit to the Chinese boat was good-it wasn't bad," she said. "I never knew that my liver was fat". The patient said her visit lasted more than six hours, from 6.30am to 1pm, although seeing the doctor on the Ark itself took only 15 minutes. The corridors were packed with Dominican patients; a woman in obvious pain fainted; doctors told a man with a pacemaker, a piece of equipment that keeps hearts pumping, that the battery was almost dead. 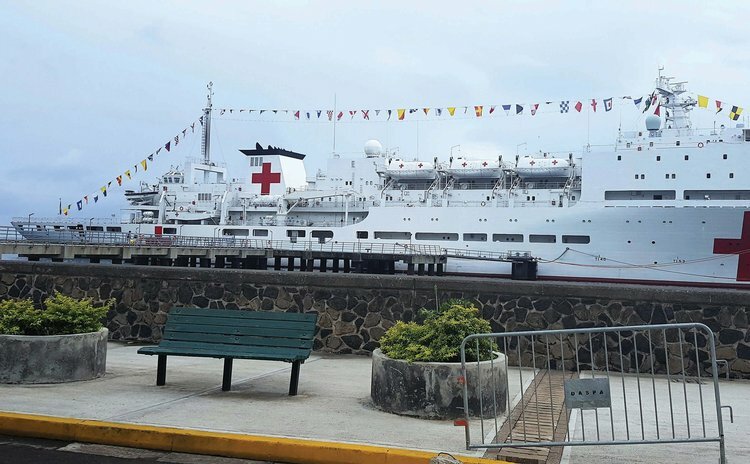 "It is clear from reports that I have received from our health authorities that the coverage of the ship's medical personnel and facilities have indeed been impressive," said Prime Minister Roosevelt Skerrit at a farewell reception last Friday. Skerrit said that doctors on the ship saw 5032 patients at an average of 800 per day and undertook 20 major surgeries. "Everyone who met the criteria of the Peace Ark was given an opportunity seek medical care," said Leticia Lestrade –Whyte, the permanent secretary in the Ministry of Health who added that doctors from the Ark also saw patients in health centres at Grandbay, Portsmouth, Salybia and Laplaine. The Peace Ark, as authorized by the Central Military Commission of the People's Republic of China, is carrying out the Medical Service of "Mission Harmony 2018", which included visits and delivery of medical services to several countries, a release from the Government information service said. Dominica was included in this mission. "The "Peace Ark" is an emergency medical support platform designed and built in the People's Republic of China. The ship comprises five main medical areas: Casualty transfer, Triage, Outpatient, Inpatient and Evacuation. The ship is outfitted with 8 fully equipped hygienic operating theatres and 300 hospital beds, a medical staff of 120 medical personnel, including 57 medical doctors, 27 nurses, 36 pharmacists, medical technicians, equipment maintenance engineers and other professionals. The ship is also equipped with advanced medical facilities as well as a Z-8 rescue helicopter," the release said. "The fully equipped on – board hospital has 21 departments and is able to carry out a number of surgeries and provide medical consultations in various fields including Gastroenterology, General surgery, Orthopedics, Ophthalmology, Obstetrics & Gynecology and Urology among others". The Peace Ark's humanitarian tours around the world have become a sign of China's outreach efforts and Beijing's ambitions of gradually expanding its military influence abroad, said the Associated Press. The ship has carried out such missions to more than 40 countries provided free medical services for more than 180,000 people since it was commissioned in 2008. In the Peace Ark's 7th "Mission" the ship was expected to visit more than ten countries, including Papua New Guinea, Vanuatu, Fiji, Tonga, Columbia, Venezuela, Grenada, Dominica, Antigua and Barbuda, Dominican Republic and Ecuador, to provide humanitarian medical services.